Welcome back! 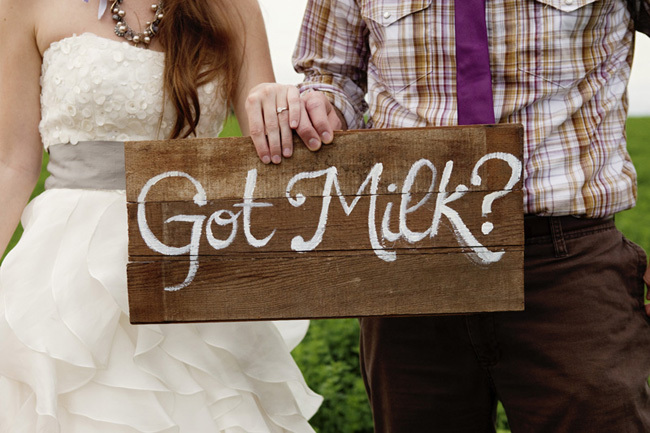 We are super pumped to show you our favorite parts of our styled shoot…the cookie and milk stands!! Make sure to check out part one here if you haven’t seen it. 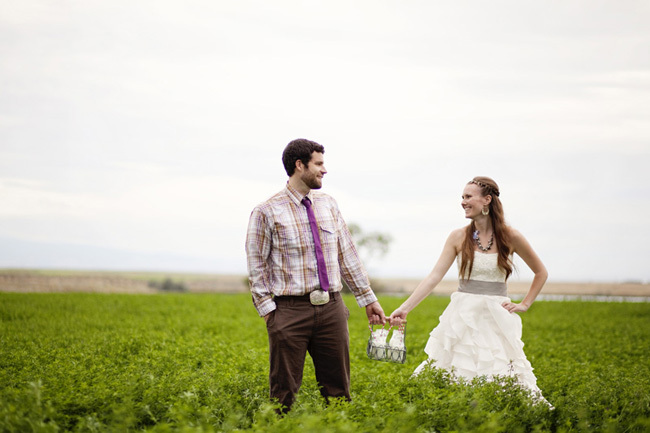 The images are the work of the fabulous Jonda Spurbeck Photographers. 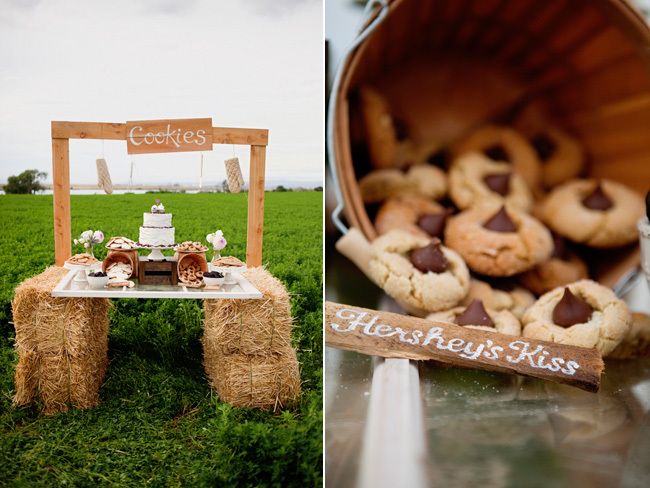 We built the cookie stand by stacking hay bales and laying a windowpane on top. 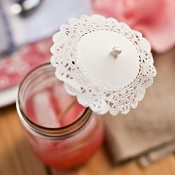 We used apple baskets to give the table some dimension and height, intermingling them with cake stands. 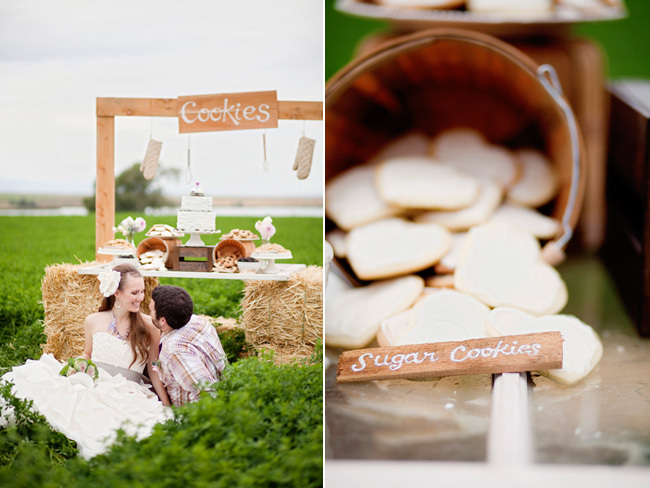 We also built a wooden “cookies” sign that hung over the table. From that, we hung oven mitts, a spatula, and a whisk! The cake was a simple two-tiered beauty that we frosted the morning of. We purposely wanted it to look messy (no really, we did!) 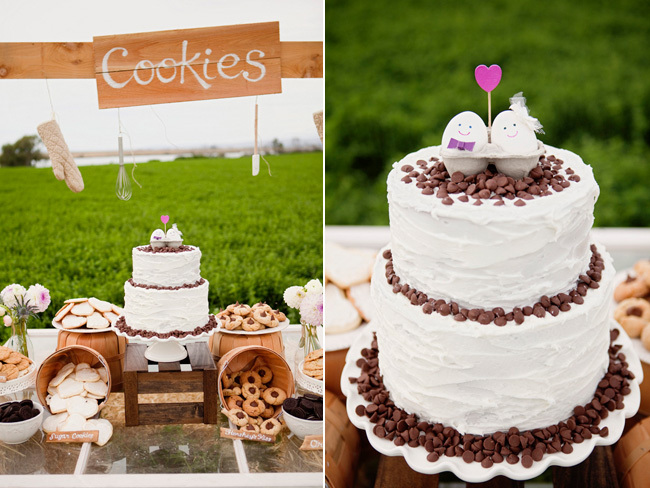 and we added chocolate chips piled on the top and around the base of each tier. 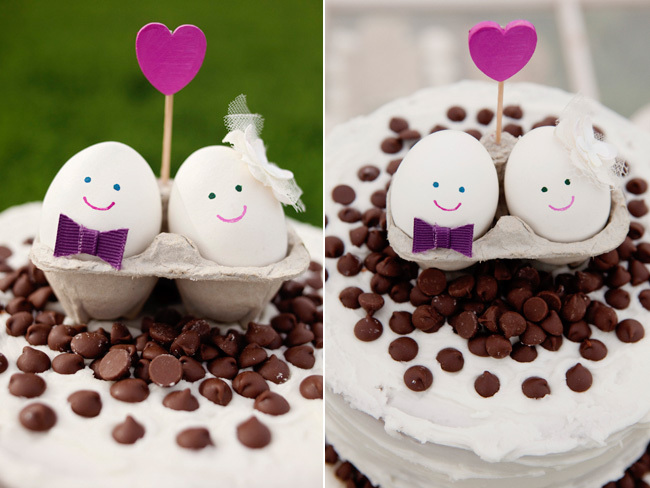 The cake topper was a fun and easy DIY. We took two hardboiled eggs, painted faces on them, and set them inside a piece of an egg carton. We added a mini hair flower, bowtie, and wooden heart to finish it off! 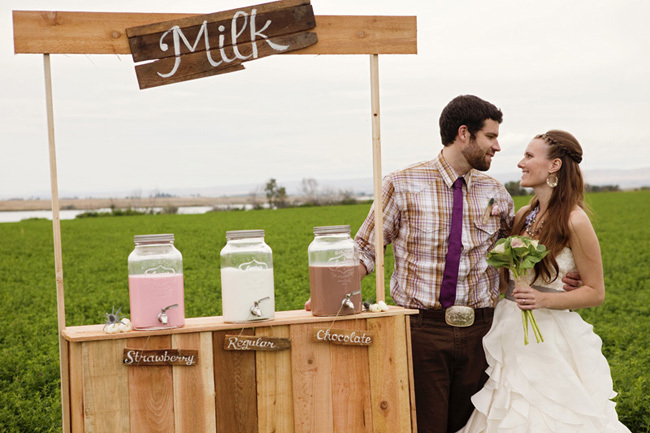 Finally, our crowning glory was the milk stand, which took both of our husbands to build. 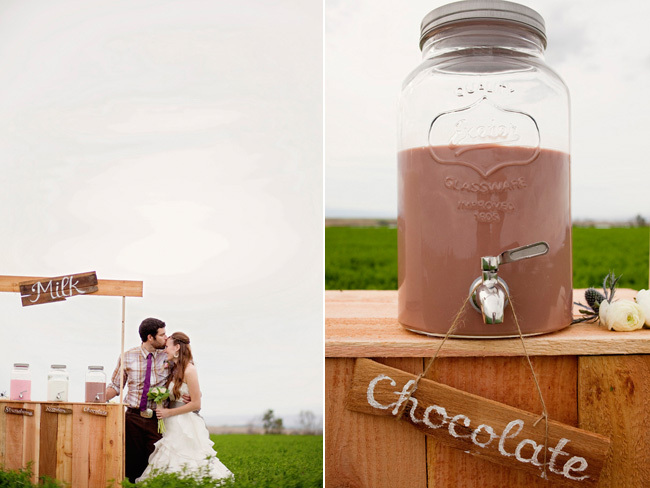 We put chocolate, strawberry, and regular milk in mason jar drink dispensers from Pottery Barn. 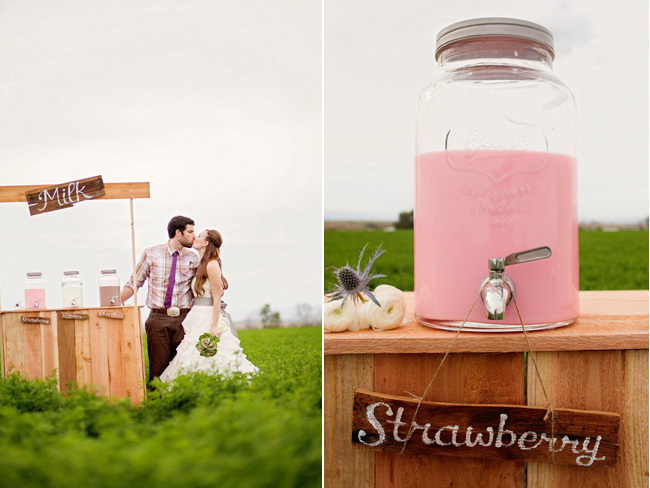 We also did a bunch of fun shots in the field, using our props and some wooden signs we made. We couldn’t resist doing a milk mustache shot! Got milk? Huge thanks to La Belle Elaines, Shop Ruche, and Feathers and Frills for contributing the dress, boots, and hairflower (respectively). 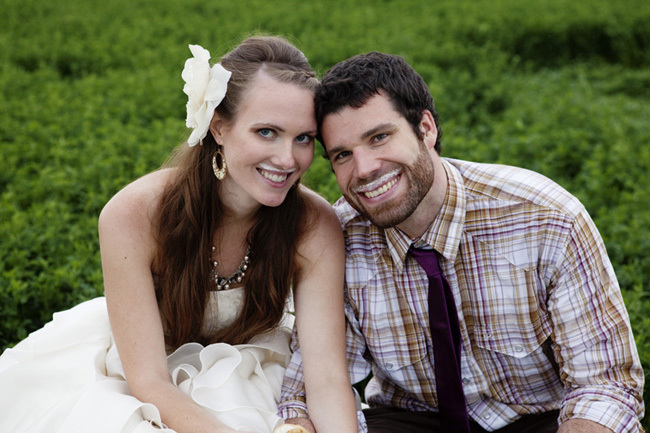 And of course, thanks to Jonda Spurbeck for the amazing photography! hi there! so cute! is there any way I can get the measurements for the ingredients that go in the frappuccino bottles…. so clever!! 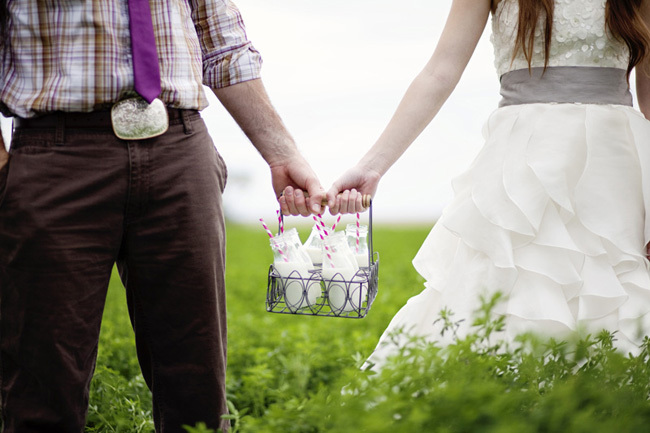 Sooooooo cute and sweet wedding photography, I love the blog. 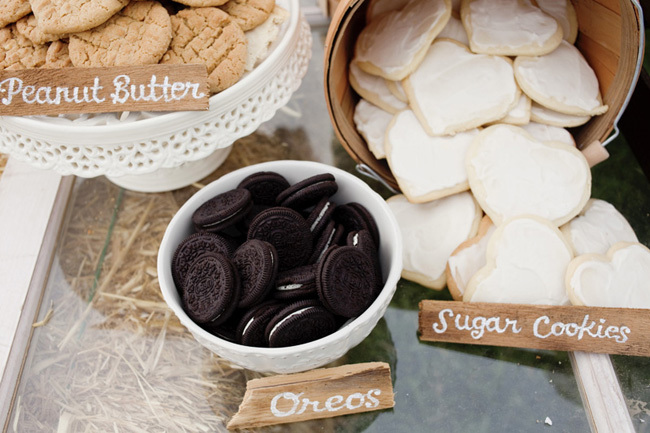 I LOVE the cookie mix in a jar idea! Would you please send me the recipe!?! Thanks! LOVE IT,,! 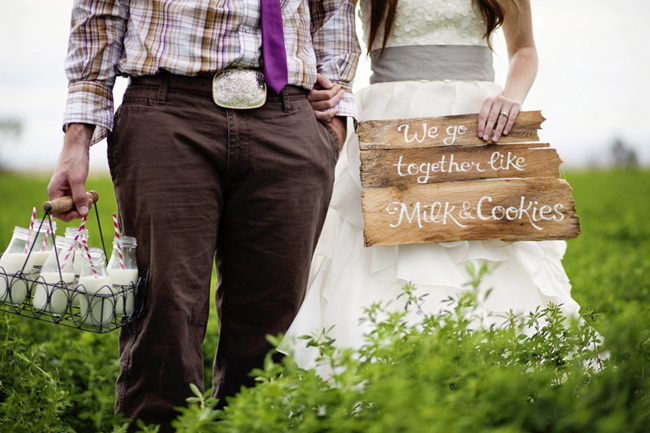 Do you ave the download available for the “recipe for love” cards yet?!? I plan on using the frap bottles too for my daughter’s 1st birthday party. 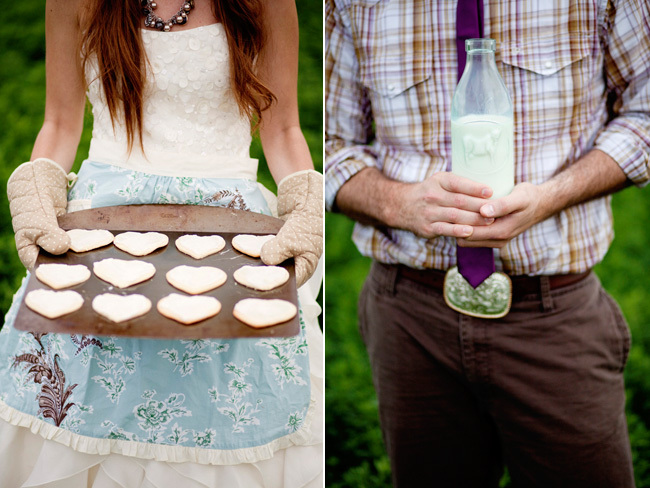 I want to do a favor for the guests with the cookie mix in the remanding bottles. Do you have the recipe with the ingredients and the directions that you wouldn’t mind sharing? Or can you direct me on how to cut down a recipe for to make cookies in such a small bottle? The shoot is absolutely beautiful. Would you please email me the recipe/quantity amounts per frappuccino bottle for the chocolate chip oatmeal cookies featured in your mild and cookies styled shoot? Thank you. This is lovely! 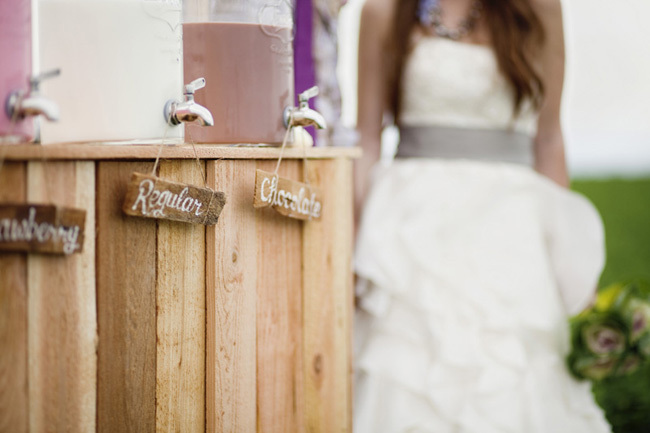 I really like the large dispensers filled with milk – so cute! I LOVE this! Its perfection. My favorite is the cake topper. perfect! thanks so much, that definitely makes it easy! 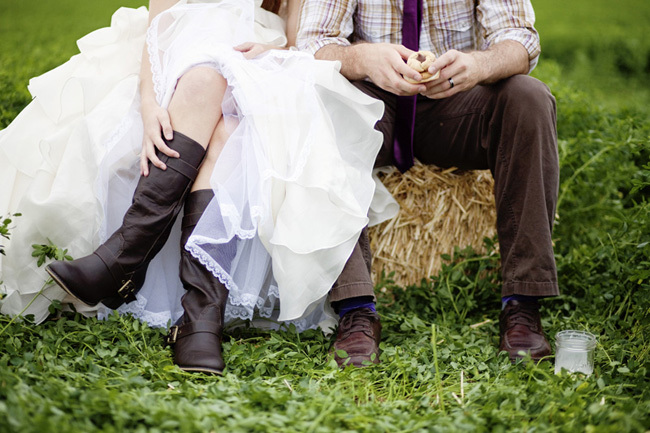 Oh wow, this shoot is beyond adorable!!! Man you are so lucky you got to do a wedding photo-shoot all over again! I know a lot of girls who would love that, including myself. I really like the milk-mustache one, its awesome! where did you get the large milk dispensers from? I love them! seriously so stinkin’ cute. 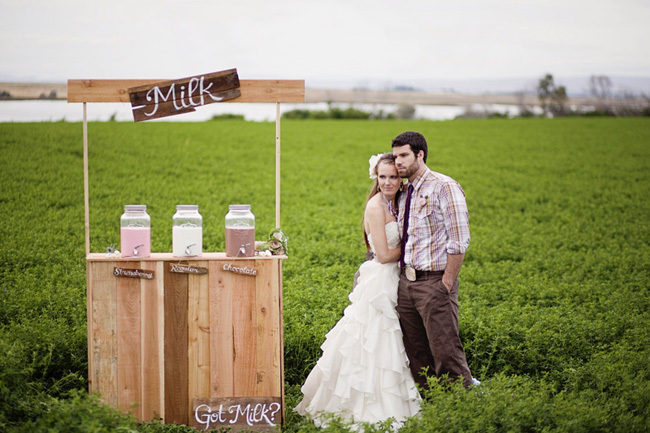 the milk stand is genius. well done! Hi Whitney! The milk bottles were actually frappuccino bottles, which you can get at any grocery store! With the labels peeled off, they look just like milk bottles. Have I told you how happy this shoot makes me? Because it’s heaven. I really love that cake! I LOVE this shoot, it’s brilliant! Do you mind divulging where you got your milk bottles from?? I completely adore them, but I haven’t been able to figure out where people are getting them! Love your work! seriously ladies i love this shoot! all the detail are perfect! seriously loooooove this shoot. 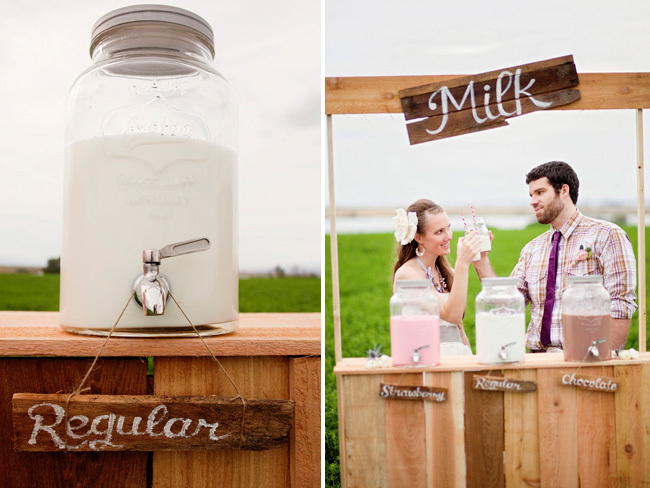 the milk stand is adorable! !